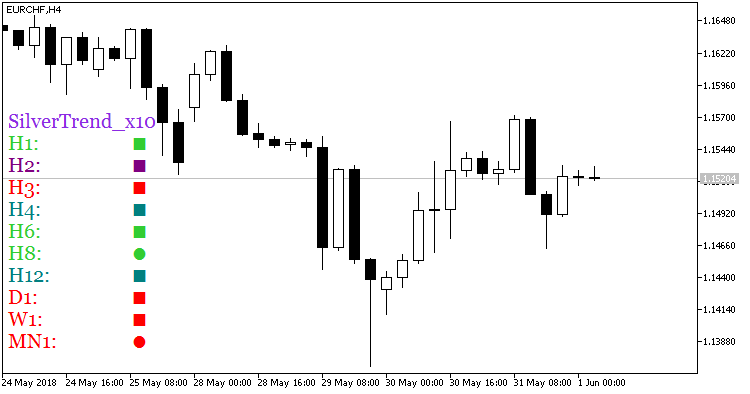 Indicator SilverTrend_x10 shows the color of the SilverTrend indicator candlesticks from ten different timeframes from the bar defined in the indicator input parameters. The trend continuation is shown as a square, while the trend change is shown as a circle. For the indicator to operate, the BrainTrend.ex5 indicator must be added to the <terminal_data_directory>\MQL5\Indicators folder.